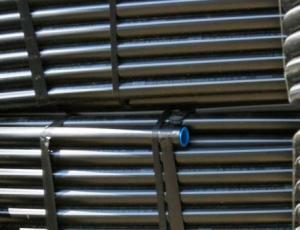 Aqua-Jet high-density polyethylene [HDPE, PE-4710, "black plastic"] pipe is manufactured in the USA. This pipe is NSF-approved for potable [drinking] water ("NSF-pw" is printed on the outside). Higher pressure ratings mean more durability, strength and burst resistance. We recommend that you use pipe rated for at least 125% of the pressure of your pump or water service. Many submersible pumps can easily exceed 100psi. Pressure ratings are measured at 73°F. Numerical markings are spaced every two feet for easy measuring. CTS [copper tubing size] waterline meets ASTM D2737 specifications. CTS sized pipe uses compression fittings. Our HDPE pipe comes in rolls. If you are purchasing rolls of our pipe on the Internet, shipping can be a significant cost factor. Some of the smaller rolls of pipe can ship via UPS, but many can only ship via freight. Even when a roll of pipe can ship via UPS, due to it being oversized, UPS charges a premium. The oversized premium shipping charges start around $100 for many locations and goes up from there. If a roll is too large to ship UPS, our shopping cart estimates the freight cost, which starts at $135 for a business delivery. If your order comes to us with a freight estimated charge, we calculate the actual cost and if it is less than the estimate, we will ship the order and refund the difference. If the actual shipping charge is more than the estimate, we will contact you with the actual shipping charge to obtain your approval before we process the order. Please make sure you provide valid ways for us to contact you. poly rope, rubber hose, check valves, foot valves, pitless adapters, well seals and ells, well caps, water well supplies.